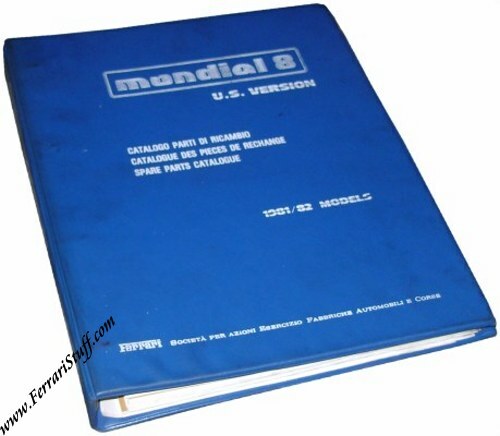 Ferrari factory original Parts Catalog for the 1981 and 1982 Ferrari Mondial 8 US Versions. This Ferrari Parts Catalog contains 120 exploded view drawings and 120 tables listing the individual parts. The index pages are in Italian, English and French, the tables listing the parts are in Italian only. It comes in factory original blue binder with silk-screened text in white. Ferrari Print Number 214/81, issued in September 1981, printed by Graphotecnica Maranello, Italy. This is a slightly used document but in very good condition. Original parts catalogs are very scarce and hard to find as the factory forbids dealers and importers to sell these outside the official Ferrari dealer organization.